A new issue of the Atlantic Monthly came out this week, and it is all about aging and life expectancy. The main article is called “What Happens When We All Live to be 100” by Gregg Easterbrook. There is a detailed graph (see Figure 1 below) showing life expectancy in the United States. The graph starts at 1880, and goes until today. At first, the life expectancy in the U.S was under 40 (39.4) The graph immediately reminded me of the Demographic transition chart we constructed and annotated in class last week. In 1880, the United States had a much higher birth and date rate, but a lower population than today. The graph shown in the article also projects ahead to the year 2080. 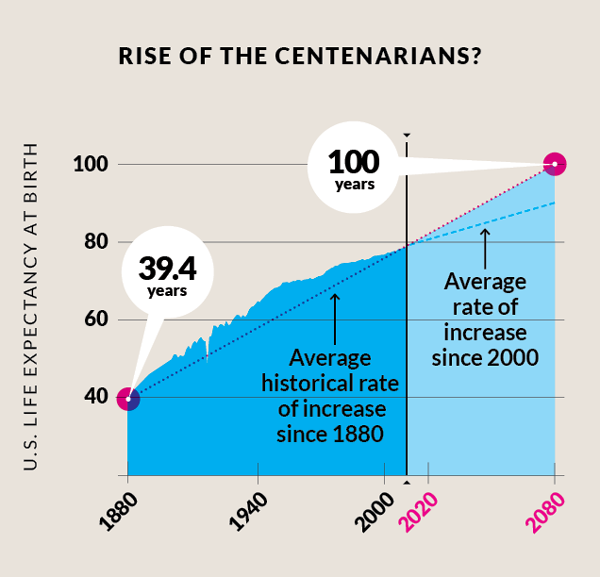 If the average rate of growth that we’ve had in this country since 1880 continues, life expectancy will pass 100 by 2080. This figure would be lower if we continued at the growth rate of the last twenty years, but it will still be over 90 years old. The article then goes on to list all the areas of research that have grown in this country around preventing or slowing down the effects of aging. The author, Gregg Easterbrook, is somewhat skeptical of most of them. For example, near San Francisco is a company called the “Buck Institute”, founded by a family of wealthy oil industrialists who wanted to find out why we age. Researchers at the Buck Institute experiment with DNA modification: if a gene can be found that is responsible for telling cells to slow down and begin to die, then a mutation of that gene may stop aging from occurring. Easterbrook interviewed a scientist at Buck, who never eats any bad foods, runs roughly 20 miles a week, and takes all kinds of supplements that may have extended the life of lab rats. The scientist, however, still looks as though he is aging at a normal rate as someone who isn’t taking these precautious measures. Another trend that the author of this article critiques is caloric restriction. Mice, who are fed very low calorie meals may live longer, but are in a state of near hibernation. Easterbrook wonders if living to 100 means we will be hungry all through the day. One idea keeps coming up again and again in this article: if we live so long, will it actually make our lives better? From the standpoint of evolution, an organism that has gotten too old to reproduce anymore is no longer important in the big picture. An aging organism cannot contribute to a changing and evolving gene pool anymore. This means that the changes in CBR, CDR, life expectancy, and other Demographic trends are new in human history and in the history of life on Earth. These are questions raised by the class, but also something we will have to deal with in the future. “What Happens When We All Live To Be 100” by Gregg Easterbrook.